On the other side of the fence was the "right," the people that did not want the Beatles to come to Japan. They did not approve of the influence of what they considered to be "American culture" being accepted by the youth in their country and felt like while the Beatles were British, they attributed to the change they were seeing in the teenagers. There was a group of extreme right Japanese men that had plans to kidnap the Beatles and cut off their hair! But most of the protests were because the Beatles were going to perform at the Budokan, which had only been open for two years and was reserved for wrestling and athletics and not for rock concerts. This upset thousands upon thousands of people and formal protests occurred. 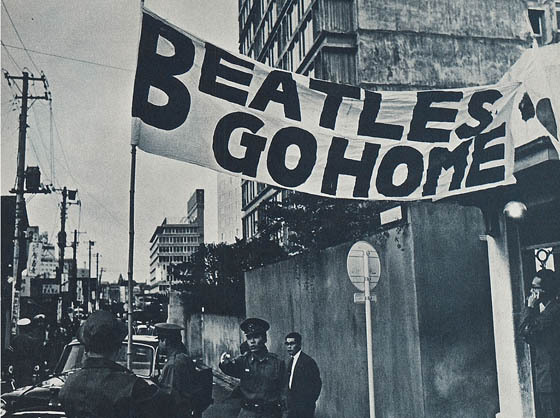 The Beatles weren't really accustomed to being protested. Sure, there had been little things here and there over the years, but this one was the first really big protest---and it sure wasn't the last!